The CushKins improved their reading, writing, and speaking skills as they worked collaboratively on this project. Using Skype, the class visited classrooms from Kenya to the Carolinas, to meet new students and celebrate similarities and differences. They took a walking field trip to our local food pantry about the same time we read Hansel and Gretel and quickly realized that hunger was not just a problem in fairy tales. Our virtual field trip to the Mitahato Teaching Farm helped understand that problems of hunger had solutions. The class visited Herring Gut Center and began an aquaponic growing system along with helping to form the Global Garden Project. Skype visits with authors, actors from Matilda the Musical, and characters from Wondergrove Learn all helped to shape the final showcase of learning and our book and movie products below. 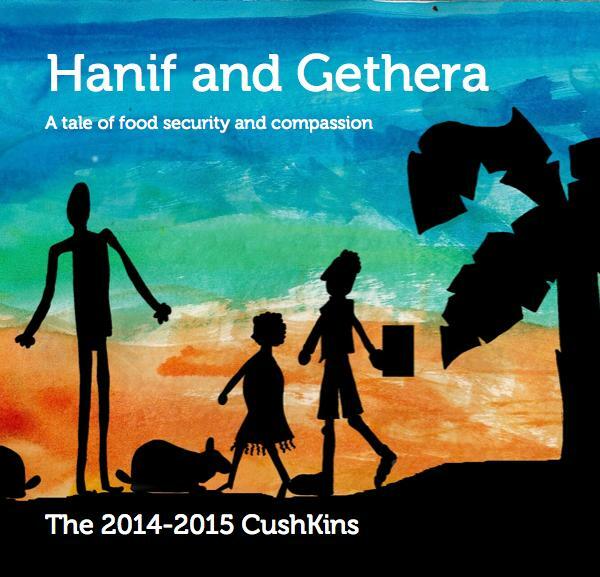 The CushKins used scientific drawing techniques to create accurate silhouettes that they overlaid onto scans of their original water color paintings to create beautiful illustrations for this tale of food security and compassion. The full book can be previewed here. We used green screen technology to bring our book to life and pretend we were really in Kenya! We had a great time making the movie and hope you watch the whole thing...but especially the last five minutes of credits! That's our very favorite part! We wanted to do more! So we encouraged people to contribute to our local food pantry. We think ours is a great place and encourage you to help your local food pantry, too! Read more about our garden project by downloading the .pdf on the right. We had a great first growing season!